GreenPower is delighted to announce that it has been named the Best Green Business in the Forth Valley Chamber of Commerce Business Awards 2015. 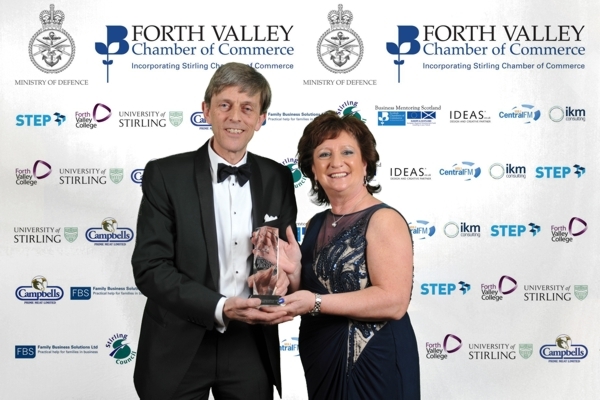 The awards, sponsored by the Ministry of Defence, which celebrated the success of businesses from across Central Scotland within 12 categories, took place at the DoubleTree by Hilton Dunblane Hydro on 19th March. Phil Parkin, Director, GreenPower: “GreenPower is delighted to be selected as the winner of the Best Green Business Award in these prestigious awards. At the awards ceremony last night in front of 450 guests I was proud to accept the award for Best Green Business on behalf of the hardworking team at GreenPower. GreenPower are a small privately owned Scottish company based in Alloa but usually operate in remote areas all over Scotland and the UK, so it is especially pleasing to be selected as a finalist in our own back yard by the Forth Valley Chamber of Commerce for our business achievements”. The Best Green Business award is for the business which can demonstrate the development of new business opportunities arising from emerging environmental technologies and practices. GreenPower is a 50% owner of the recently completed Carraig Gheal 20 turbine 46MW wind farm in Argyll and Bute. GreenPower Director Phil Parkin accepting the Best Green Business Award presented by Liz Cameron OBE, Chief Executive of Scottish Chambers of Commerce.